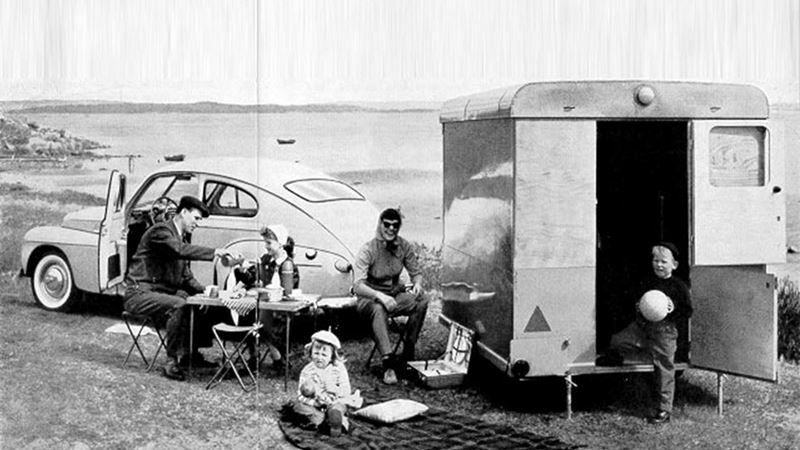 "Travel with your own hotel" was the main heading of the brochure for the camping trailer in 1957. In the fifties, travelling by car was a novel idea made popular by an increasingly popular new phenomenon - the annual holiday. If, in addition, the car interior could convert into a bed for two, the car virtually sold itself. Volvo Cars has a long tradition of offering cars that combine flexibility with versatility. Today we can e.g. offer a camping table as an accessory for the V70, XC70 and XC90 models. Already in 1957, however, we were demonstrating our concern for family life. Full height: 180 cm. Ready to run - height: 103 cm. Width: 180 cm. Overall length, incl. tow hook: 310 cm. Overall length, body: 225 cm, weight 320 kg. Linells Vagn AB is owned by AB Volvo since 1974 and is today knowed as VAH, Volvo Articulated Haulers AB.